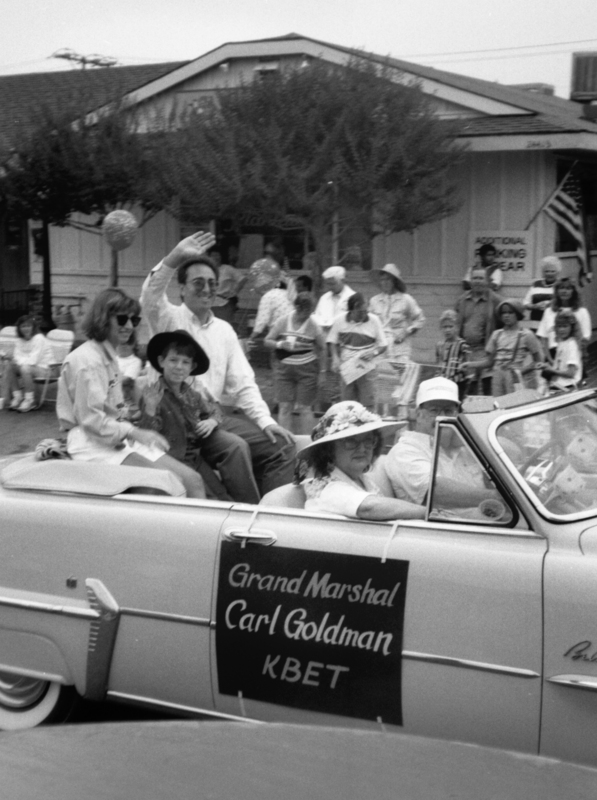 July 4, 1994 — Carl Goldman, grand marshal of the 1994 SCV Fourth of July Parade in downtown Newhall. With wife Jeri Seratti-Goldman and son Ryan Van Wie in front of Gallagher's Restaurant on Walnut Street. (Before and afterward, Gallagher's was the Egg Plantation.) The parade went down Walnut Street that year, instead of San Fernando Road (later called Main Street). The theme of the 1994 parade was Earthquake Heroes, honoring those who served in the aftermath of the Northridge earthquake of Jan. 17, 1994. When you think of "earthquake heroes," who comes to mind? Firefighters? Police officers? Hospital workers? City staffers? Utility company linemen? How about the National Guardsmen who distribute free water? Surely all of them, and more. But in Santa Clarita Valley residents' minds in 1994, one name stood out above all: Carl Goldman, co-owner and the public face of KBET, the SCV's "only local radio station." It's difficult today to imagine a time before Twitter and Facebook and smart phones that facilitate instant gratification when it comes to news. But when God or Mother Nature or simply the Earth's whimsy threw the Santa Clarita Valley into panic at 4:31 a.m. on Jan. 17, there was no place to get the sort of ultra-local, up-to-the-minute news we needed ... until KBET went back on the air less than 24 hours after the first temblor hit. Network television affiliates did an OK job with on-the-ground coverage in Northridge — they couldn't reach the SCV by ground for weeks — and newspapers provided a good daily roundup of what had happened as of the night before. But Santa Claritans needed to know what was "news" on their street. They needed to know how soon their neighborhood tap water would be safe to drink. They needed to know what roads were open. They needed to know where they could shop for provisions. They needed to know what to tell their kids. And they needed to know now. Across the Santa Clarita Valley, there was one place to get that type of breaking information. And it didn't require electricity. By candlelight on those early nights, in their own homes or at the Red Cross shelter in the Boys and Girls Club gymnasium at Newhall Park, Santa Claritans tuned their battery-powered radios to 1220 on the AM dial. KBET was on the air, and it stayed on the air 24/7 as long as the public needed it to. The City Council declared it Santa Clarita's official emergency radio station. More than anything, it told folks they were not alone. Santa Clarita eventually bounced back, as it always does. Carl Goldman, who had purchased the radio station out of bankruptcy in 1990 for about $600,000 with investor partners, sold it in 1998 to Clear Channel for $3 million. But then a funny thing happened. Evidently he missed it, or maybe he didn't appreciate the way the new owner debased it by taking the "local" out of it, or maybe he recognized an opportunity when he saw one — probably all three. On Oct. 24, 2003, Carl and wife Jeri Seratti-Goldman repurchased the radio station for just $900,000. No outside partners this time. In practically no time, they built it up again. They knew the formula. They put the "local" back into it, and the community was hungry for it. It was still AM-1220 on the radio dial, but now it had new call letters — KHTS, your "Home Town Station" — and soon it was on the Internet, too, at hometownstation.com. They also knew the formula for coordinating resources in a disaster. In the wake of severe flooding in 2004, Jeri helped implement her idea of an SCV Disaster Coaltion that would bring together agencies and organizations to provide humanitarian relief during a crisis. Under the umbrella of the nonprofit SCV Committee on Aging (which runs the SCV Senior Center), the coalition expanded after Hurricane Katrina in 2005 to provide assistance and know-how to disaster victims elsewhere, while continuing to raise money and provide shelter for persons displaced by brush fires and other emergencies at home. So the next time the earth moves or flames threaten our neighborhods — and you know they will — you'll also know where to set your car radio or point your handheld device to get the information you want and need. LW9450a: 19200 dpi jpeg from photograph (BW negative) by Leon Worden.